Joaquim Alberto Chissano was the second President of Mozambique, serving from 1986 to 2005. Since leaving the presidency, he has campaigned for peace through his work as an envoy and peace negotiator for the United Nations. 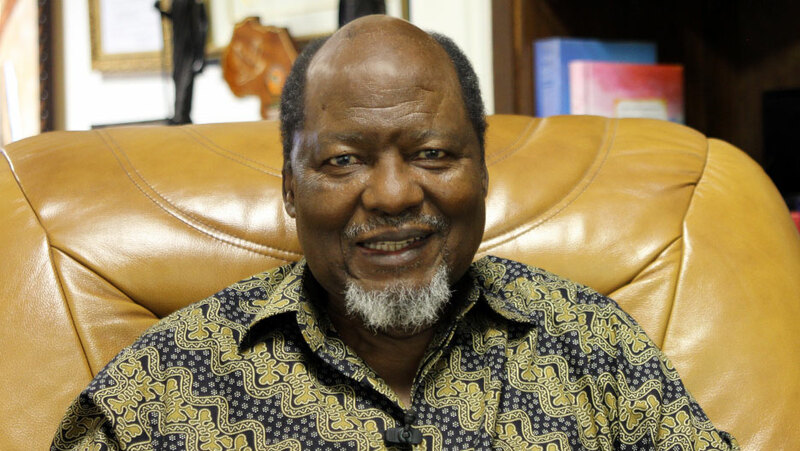 Chissano also served as Chairperson of the African Union from July 2003 to July 2004. In 2007, he was awarded the inaugural Prize for Achievement in African Leadership by the Mo Ibrahim Foundation. Joaquim Chissano is also a member of the Fondation Chirac's honour committee, as well as an eminent member of the Sergio Vieira de Mello Foundation. He is Chairman of the Board of Directors of the Joaquim Chissano Foundation, a private, non-profit organization dedicated to the promotion of peace, economic and cultural development in Mozambique. First of all, you have had an amazing career, following your time as President, of essentially trying to put out fires here and there, wherever there are some issues, such as political problems; and even beyond that, in the broader African regional context, as with Madagascar and Guinea Bissau, among many others. Could you first give us an idea of how you go about this, why they come to you, and what is your secret? There are no secrets. Mozambique lived through a very difficult time, since the country declared its Independence until I became Head of State. There was war, there were many deaths, with thousands upon thousands killed and maimed. There was a great deal of destruction in the country, but we finally found room to bring back peace, though the path of dialogue. This was at first indirect, then a direct dialogue. 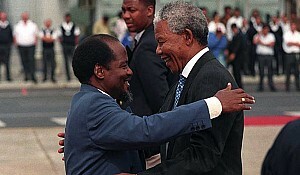 This was the first thing the world has been able to see in Mozambique and in me, particularly as I had taken part in this process for eleven years as Minister of Foreign Affairs, also dealing with other conflicts in the context of the African Union, which was previously the Organization of African Unity. I then continued these commitments when I was already Head of State, both in the Organization of African Unity and the African Union. There were certainly conflicts. These we discussed, while trying collectively to find solutions. But in the case of Mozambique, this was something I had to deal with directly, and we came to peace. This was what first made countries take notice of me as someone who could help with ideas. Secondly, there's the way I left power as Head of State, when I decided not to run for another term, which was the last opportunity available to me, in order to become President again for another five years. This I decided not to do. All of this led the world to think that I had some experience in dealing with conflict, but also in looking at ways to end conflict and to start building peace. The peace that we brought to Mozambique was not easy, but it brought us many friends and sparked a good deal of dialogue within our society, along with the return of many freedoms, thus allowing us to begin a new life. This is why I was called upon from the outset by the Secretary General of the United Nations. Interestingly, my first mission was not about conflict, but on MDGs (Millennium Development Goals), as we were celebrating 10 years of the MDGs, which were then being discussed, and he wanted me to be something of an activist in Africa in this regard. He had several of us dealing with different countries. I'm speaking about Secretary General Kofi Annan. He sent envoys to Europe, to Latin America, to Asia, and he asked me to deal with African states. I believe this also contributed to peace, given the relationship between peace and development. If you look at when you left power, peace had returned; and so many people could again talk with Mozambique, along with Western countries putting some money into the country. Even the opposition leader was living here in Maputo. Such was the situation. Now, since your departure from office, everything seems to have gone downwards; not that fast, but basically the problem now is that the opposition leader no longer lives in Maputo, but is hiding somewhere. Therefore, couldn’t you say that everything you had worked for has been lost or is somewhat gone? This is not my reading of events. I'm very much an optimist in the way I look at things. The peace that we brought to Mozambique was not easy, but it brought us many friends and sparked a good deal of dialogue within our society, along with the return of many freedoms, thus allowing us to begin a new life. You can't say that since I left power, everything has regressed quite so much. Just look at the companies. Of course, I had made contact and held talks with some of them. But the companies that came here to invest in large projects did so after I had left. I'm speaking about American companies, such as Anadarko, the Italian company ENI, or the Brazilian company Vale. Vale was already here when I left, but they kept going and many more companies are coming, from India and many other places. Over the past ten years, some construction has taken place, along with improvements in electricity. There were undoubtedly problems. People talked about them, but the economy continued to develop, partners continued to arrive and even contributed directly to the national budget, which is something that has continued. We should therefore not misread isolated problems that arise; and I even believe the leader of the opposition began to move out of Maputo during my term, preferring somewhere else for personal reasons. I don't see the relationship between my leaving power and Dhlakama's place of residence. 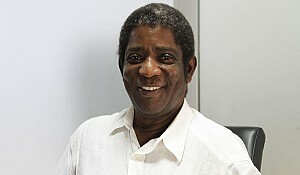 I believe Dhlakama is looking for the best strategies that work for him, and living away from Maputo allows him to escape some of its pressures, given that the capital does have a lot of pressures: not only the people and the Government, but the diplomatic corps and people with different opinions. But in the provinces, in the bush, he doesn't need to listen to all of this, which could be among his strategies, although I can't speak on his behalf. Also, from a distance, or somewhere referred to as an 'unknown' location, he is able to put more pressure on the Government, in order for the Government to come closer to his views than when he is here, because he can speak with a loud voice and frighten the Government, but above all frighten citizens. When the people are frightened, this puts pressure on the Government, so these are his own tactics, in order to get his way, just to answer your question. As I understand it, you're not dealing with the negotiations underway, but just supposing you were, what approach would you take, given that you have taken part in similar negotiations here and elsewhere? I would do the same thing I do elsewhere, which is to first hear the opinion of the people, along with the civil society and political parties. I would not deal with just one or two actors. In this case, I would not deal with just Renamo or the Government, listening to just one or the other. I would collect many views, and it does take time as well as patience to be able to deal with this. Listening to all these views allows for more inputs, in order to arrive at a solution. And solutions are not reached within a day. You may have one, and then you come back with another proposal, then another. I often avoided bringing proposals myself, but I caused the parties involved to bring proposals to the table, since I believe that the dialogue must take place primarily between the parties. But, of course, the people's opinion, and that of civil society, does matter; because, ultimately you want peace for the people. In the meantime, the country is suffering because investors are not coming here, and this puts pressure on the country's economy, which is of course suffering due to other external reasons. But this adds another big layer of problems. We have this issue of time needed for discussion. On the other hand, people are obviously suffering because the economy is not doing well. What would you say to that? I believe this is a mistaken appraisal of investors, considering that Mozambique did not have peace after its declaration of Independence, yet there were companies that still didn't leave the country. They were firmly here even during the war, and in those days enemy forces didn't care if they destroyed whatever there was in Mozambique. But they persisted, and some small investments came even during the war, which increased significantly once peace arrived. This is just to illustrate that even in the worst case scenario, the economy can still keep going; not necessarily thrive, but still maintain some operations. In the current case, I don't believe this is a war. It's not spread across the country. There's a focus of disturbance, in an attempt to put pressure on the Government, and it seems to me that the opposition now realises that the economy cannot be altogether destroyed. They can't go and attack the coal mines, if they ultimately wish to rule; they also can't destroy the power lines, as they did during the first days of this destabilisation - which I now don't think can go very far, because their argument is that they want to come to power, and they want to come to power in order to rule. I honestly don't think they can imagine that on getting there they'll rebuild all that they're out to destroy. We have power lines that are thousands and thousands of kilometres long. It took us whole years to build these, and the Government is still building another branch or more. They must clearly realise that if they come and rule, they need this infrastructure in place. This also applies to bridges. They can't just think about destroying them. Anadarko, Vale and ENI are here, and I don't see the insurgents destroying their platforms. Therefore, if these partners had a part to play, it would be more a contribution to better sense, aimed at those seeking to destabilise the Government. This allows for a space to search for solutions, and they could themselves intervene positively. That works, but what about tourism? You could say an investor gives more thought to things, but tourists are easily discouraged. However, the country needs foreign currency. Tourism certainly cannot thrive in a situation of conflict, especially if there are attacks on certain roads, as is currently the case. A main road has been attacked in one portion of the country, but the tourist wants to be free to go wherever. Even when there is no conflict, a tourist may have the feeling that anything may happen. In this respect, you're right, because in this process of exerting pressure, the enemy may not mind killing a single tourist, in order to create a sensation and make people feel that this Government is unable to protect visitors, or even its own citizens, which could be among their tactics. I believe investors themselves should in fact seize this opportunity, where things seem to be at a standstill. Those who come in now can do wonders. I see hotels being built around here and I applaud these people, because this wave of unrest will subside, and when it does, tourism will return in full force. Actually, tourists have never stopped coming altogether, even during the worst of times. But you're right: they won't come in the numbers that we're hoping for and seeking to promote. War has never been a friend of development. This applies not only to tourism, but to manpower itself, which faces problems when there's unrest, because people must be free to travel, whether it's to work, or to go on holidays and return to work. Traders too need to travel up and down the country. Of course, I feel it's absurd. It's almost like stopping the traffic of vehicles in one direction and not the other, believing that one part of the country is benefitting from this or being protected. But traffic must flow on both sides. There are raw materials coming from the North to the South for some processing, as well as goods going from the South to the North, including some raw materials going to the North for processing or for construction purposes, which could be sourced from somewhere in the South. I can talk about medicines, fertilisers or practically anything. You never know what lorry needs to go from one point to the other. Therefore, the best thing is just to have peace and no unrest at all. You are personally involved in the country's economy, since you are an active player in agroindustry and agriculture. You also have your own vision with regards to agroindustry, as well as its relationship with the environment. I would like to know where Mozambique can have a say in this respect, given that this is a tremendously large country, which makes for a bright future for agriculture. What is your vision of the development of the agroindustry and agriculture sectors here? My vision is that we need to provide more training to people, in order to be able to make use of more sustainable ways of doing agriculture. Also, the Government, and all those who can work with it, whether technically or financially, should create the infrastructure and bring in the necessary equipment, so that there's less of a need to develop new areas for agriculture, but improve existing areas instead. In other words, being able to produce more crops in a small space - either cash crops or food crops. This can be achieved through training, or with the necessary equipment and technology. Training comes first, not just in terms of how you till the land (i.e. zero tilling, organic fertilisers, etc. ), but also in terms of management, which allows people to become richer from what they do and then enables them to go from subsistence farming to commercial farming, while also introducing the processing element, as the only way one can increase one's revenue in agriculture. It's vital to add value to your products, through processing, together with creating a good market. The goal, therefore, is to improve the capacity of both small and medium-scale farmers to achieve it, thus becoming a cornerstone for development, as per the wishes of the Government’s programme: reclaiming agriculture and turning it into a foundation for development. All of these things must come together. It's not easy to train engineers in agronomy and then have them come out and wait to be employed by the State. This is not enough. The State should certainly employ a few of them, in order to train those who are on the field, i.e. both small and medium-scale farmers, or even some large-scale farmers who may not be doing things correctly. I'm not mentioning bigger farmers, because I'm assuming that when they become big, they know what to do, in order to attain higher revenue or profit. Going further than just agroindustry, how do you think Mozambique should develop? You mentioned the fact that agroindustry and agriculture are the way to socially increase everyone's revenues, and of course Mozambique currently doesn't export anything on this front - or practically anything, save for a few raw materials. On the other hand, the country buys a good deal from abroad, which is why agroindustry is certainly one of the areas that needs to be developed. But where do you think Mozambique should focus its efforts, and where do you think investors should come and invest in the country? I won't be saying anything new, because the way we would like to develop the country has been outlined since our Independence, which is to have agriculture as a foundation in economic terms. But this is necessarily linked to education as a first priority, followed by health, while having agriculture as an economic foundation. However, it was also said that industry should be the aim, to be built upon this foundation, which is why we saw industrial development as the 'energising' factor. When I talk about industry, I am referring to agroindustry in the first instance, but also all other types of industry that require know-how. My vision is that we need to provide more training to people, in order to be able to make use of more sustainable ways of doing agriculture. Also, the Government should create the infrastructure and bring in the necessary equipment. Let us take a very simple example. In Mozambique, we produce cotton, but our factories have closed, because we lacked the know-how, and then we didn't have the cash to invest in maintaining and modernising our facilities, in order for these to be competitive. Therefore, ensuring adequate education is basic. This involves teaching people not only to know things, but also to know how to implement their knowledge. The other example I can give you is that of gas, which we now have in Mozambique. But we'll soon be requesting someone to come in and install the simplest of factories, in order to make plastic cups, which could easily be done by us in Mozambique. Therefore, it's necessary to train people to be able to do these kinds of things. We could talk about many other examples. We have timber, we have other minerals, even iron ore in some places. The question is how to transform all of this. I don't mean this can be done overnight, but if over these past forty years we had placed more emphasis on actually teaching people how to do things, by now we would have qualified people, although we would still need foreign investors over a long period, with technology and the like. But we would have our own people, who could gradually become industrialists in various fields of activity. This is the second time you have mentioned training in this interview. You really do hit the nail on the head with education and training, which nonetheless don't seem to have reached the levels required. There's a gap here. Therefore, what should be done, and why hasn't it been possible yet to train people? It has been a long time, and nothing is produced internally, which means people are not yet trained. What is the solution? We also need to be fair with ourselves. We began our development process from scratch, and so the priority was not exactly to train technicians, but to implement literacy programmes. People first needed to read and write, which is vital. Then you come to a second stage. We have also had destabilisation throughout this whole process, both of the economy and of the very education and training programme. This is why the results are not so good, yet. But I do know that the Government is reviewing the situation, in order to provide education with a new focus, since we now have many universities. This requires setting a new course for these universities, but not exclusively so: even for the lower classes, particularly secondary education. Secondary education should be about producing 'doers': people who come out to do things, not people who come out to seek employment and be told what to do, but who can do things by themselves. Education should also enable people to seek and provide solutions, which is what universities should be about. I didn't go to university, but I sent thousands of people to university, in order for them to make the difference. They should not come to me and ask me what to do, or ask for employment. Instead, they should bring the solution. Therefore, education needs to be framed in such a way so as to bring this about: making people feel that they're responsible for coming up with the solutions for their own country's problems. That leads me to my next question, about FUNDE, a foundation of which you are the President and which provides many benefits, as well as encouraging university and polytechnic access. Could you tell us what is your vision for FUNDE? What goals would you like to achieve through this organisation? Actually, FUNDE was created to connect universities with people, and all their problems, starting from elementary problems such as nutrition, which is basic but most important. Universities should pay attention to this area through direct and unmediated participation. My desire would have been to be closer to people’s living base, in order to deal with their problems. Well, I am unable to do this everywhere in Mozambique, even if I could be free from outside demands, such as contributing towards solutions to international problems. But universities can, because there are many now, and they are training a good deal of people. Universidade Politécnica, where I am more involved, was among the first universities to perceive the need to link the productive sector with the university, i.e. enterprise and its needs. Therefore, FUNDE set out to ensure the communication required, while dealing with the main problems brought about by development. For instance, when coal companies go somewhere to set up operations, they need to disturb the environment to some extent, also in terms of where people live, which involves resettlement. Here universities and Universidade Politécnica, through FUNDE, can help in the resettlement of people. I also mentioned the need to build capacity among people, in order to enable them to raise their own sources of income. As such, working with people is also very important. This is where you find the connection between peace and development, and where FUNDE becomes involved in practical terms. These are essentially some of the ideas we have at FUNDE. In 2007, you won first prize of the Mo Ibrahim Prize, because of your work in contributing to peace within and outside the country; an award that also included Nelson Mandela? I was the first to receive the prize. Nelson Mandela was not within the criteria, having left power many years before the prize was instituted. But on the same day I received the award, a mention was made, which also included Desmond Tutu. He was given a special award or acknowledgement by the Mo Ibrahim Foundation, in recognition of his work, but this was not exactly within the framework of the prize, which involved different criteria. Nelson Mandela said you needed a kind of philosophy in life, which allowed you to deal with conflict situations using the same approach. I just wanted to know the difference between Nelson Mandela's approach and your own approach, because it seems that you were very much involved in the military, which was not Mandela's case. This difference is key, but you seem to ultimately have a similar approach in seeking to achieve peace. There are differences and there are similarities. The difference is that Mandela did not have to work to end a war in his own country, but the similarity lies in that he had to see how groups of people, who were enemies within the same country, could come together and live in harmony. In our case, we had Mozambicans who went to work for our enemies against our Independence, but these are ultimately Mozambicans; so we wanted to see how they could come back and be together with everybody else, with the same rights. This is the core: ensuring everyone has the same rights and defending peoples' fundamental rights. I believe we had that in common. How about the approach, in terms of the way you negotiate or the way you speak to a country's opposition or Government? Looking at South Africa, I would say that Mandela came out of a process, and he began negotiations in a different environment than we did here in Mozambique. The approaches were therefore naturally different in either case, and could not be similar on all counts. My approach was simply that there should be dialogue, which again is something we probably have in common, because Mandela also supported dialogue. But then, you have to also understand that he came out of prison just as we were concluding our process of negotiations, which began in 1990, including reforms and our new Constitution, thereby laying the foundations for everyone to feel well in the country. When Mandela was released, we began to work together, in order to try and help each other to solve problems. Given your military weight, which was not his case, what bearing did this difference in background and outlook have on your relationship, while ultimately arriving at the same peace and dialogue? Now, you must understand that Mandela was the leader of the ANC's military wing, also with a good deal of experience on that front. I took part in my country's liberation struggle, as he did, although he was arrested during the early days, when we has still organising. I personally also had different tasks during the liberation struggle. My tasks had more to do with the intelligence side, rather than being involved directly in the field of operations. What was your experience of working together? Do you remember any specific highlights of the time you shared? Yes. Among the first problems Mandela encountered when he came to power was the fear some Afrikaners had about losing land, since these were people of the land and relied heavily on agriculture. They felt they didn't have enough land, and that if their lands now had to be redistributed among the majority, this would cause problems. This was something Mandela had to solve, and he thought that he could get a hand from Mozambique, in order to help him solve this problem. We obliged and we created the conditions for Afrikaners to come here. There was a leader of the Afrikaners called General William, who was the head of their cooperatives and had fought against both Angola and us in Mozambique. Mandela sent him to talk to me and we did so. We shook hands and this General William said: "You are a good General, because I did not defeat you. I was a good General, because you did not defeat me. But now we have to be on the same side, in order to bring good things to our two countries. If we agree on these terms, then we shake hands". And this is the signature among Afrikaners. The way you sign a deal is by shaking hands, which we did. The project started, but some other forces did not particularly agree with it, and Mandela had some issues in obtaining the financing in time - given that the South African side had subsidised some farmers in Mozambique; because what we did was to also create an association of Mozambican farmers, along with an association of South African farmers, in order to implement a joint programme in Mozambique. This programme was taken to the Niassa province, where we provided land and the infrastructure was built. I don't know whether some of these Afrikaners are still there, but because of the road conditions, things didn't quite move so fast. Why did we go to Niassa? Because there's more land there and a smaller population. The land is fertile and there is more water, yet South African farmers wanted to farm closer to home. 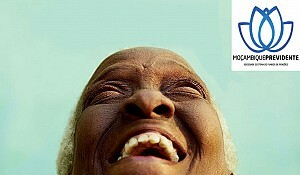 But that programme was not in vain, because there are many South Africans farming in Mozambique today. Some Afrikaners came to settle here, and they're farming. This is something that we did together. My approach was simply that there should be dialogue, which again is something we probably have in common, because Mandela also supported dialogue. Mandela and I worked on many other things. It was during Mandela's time that we began building the Maputo 'corridor', with a highway linking both countries. During his time, we also began discussing Emocil and the gas in southern Mozambique, in Inhambane province, although much of this was concluded during the time of President Thabo Mbeki. It was also during Mandela's time that we began discussing 'Spatial Development Zones', i.e. spaces for common development, namely the Lebombo development area, comprising Mozambique, Swaziland and South Africa. During Mandela's term, we began to talk about joining the Kruger Park and those in Mozambique, in order to create the Greater Limpopo, although the treaty as such was signed during Mbeki’s term. During Mandela's time in office, we also decided to have regular meetings between both governments. Two delegations were on standby to meet frequently, at least four times a year, in order to exchange reviews and the like. That's when we began discussing the need for a common border and for bringing our countries closer together. As you can see, there were many things. We also discussed SADC. Mandela had to take the place left behind by Nyerere in trying to achieve peace in Burundi. We also worked together on that. You name it! There were many occasions when we met, even if it wasn't a long period, as he was in power for just five years. But following that, we created the forum for former heads of State and Government - an initiative that I conceived and I shared with him. He agreed to take part in the first constitutive meeting, although he wasn't feeling too well by then. He became a member and made a speech at the opening session of this forum. He had the fullest respect for me, although I sought to reverse things, given his age and his intellectuality. I recognised him as senior, but he would refuse this treatment and wished to place himself lower than me. Thus, when I found him sitting somewhere, he wouldn't allow me to greet him while he was sitting. He had to stand up and would refer to me as "my President". "Welcome, my President", he used to say. Of course, he also involved me in his private life, when he started to become close to Graça Machel, who became his wife. During the early days, he approached me to inform me about his intention, respecting the fact that I was head of State, but also in keeping with African tradition. He thought there should be a family 'to be talked to' before proceeding, which was a symbolic gesture. We had some good moments. Having been President of the African Union yourself, and as a member of the forum [of former heads of State], what is your vision for Africa's development in the medium term, say in 2 or 3 years' time? We have seen Africa's economies suffering a lot, because of the drop in commodities, but what is your vision for Africa's development. When you meet as former presidents, what is your outlook? The economic crisis we're going through today is not only African in origin, nor is it limited to Africa. But I would urge all forces that have a stake in world economic development to look at Africa as one of the continents that will safeguard the world's future, given its virginity in terms of resources; both in material and human terms. This is a young continent when it comes to the age of its population, and Africa's population growth rate is high, which means it will be a well populated continent within a few years, with a significant workforce. It matters that this workforce is well qualified, thus enabling it to make a difference not only to Africa but to the world at large. Raw materials are the most dormant of Africa's resources, and one can take the example of Mozambique. Having both qualified manpower and raw materials can make a big difference. As I mentioned earlier, if we are further able to preserve our forests and our environment by making use of sustainable forms of agriculture, while also developing industry, since we should not pollute the atmosphere. Africa therefore enjoys all the assets needed to become an important player on the world economic stage. Of course, Africans have the responsibility of voluntarily trying to decrease their dependency on external sources, by acquiring ever greater knowledge; but above all, by building up our self-confidence and convincing ourselves that we are able to do things. Not only Americans can, but we can also do things. It's crucial for us to be self-confident, and we have to motivate our youth to do things. I'm happy to see more and more young people working in Mozambique. I was working with an insurance company this morning, represented by a very young lady. We didn't see this in the past. In the banks too you find young people, who have been able to master the technology, among many other such cases. This is clearly the future, but in the short term, much will depend on the willingness of our partners to say "Yes, Africa is the future, so we have to help them now", and not leave things for later. If we combine both of these, Africa can actually lay the foundations for reversing the world economic crisis. In the 70s, we had the oil crisis. This was an important crisis in an era of Cold War confrontation. Nowadays, I believe interests should converge, and if these are able to converge, for the sake of the future, now is the time to build it – within the next 2 to 3 years. This relates to what we were talking about earlier. We should not wait for the conflict to end completely in Mozambique. Increased involvement should in fact be among the ways to end conflict, in order to motivate the population. As someone in the farming business, I can say that when us farmers see clouds, we go and start sowing the fields, then wait for the rain to come; rather than waiting for the rain to fall first, then going to buy seeds and coming back, start preparing the land, etc., after which we may miss the opportunity. This is time for sowing. We shouldn't be discouraged by the fact there may still be drought. The clouds are there and rain may come. In fact, during my lifetime, even as President, I had a good experience when travelling to the countryside. I went to places where there was no rain and it was completely dry. I found people crying for rain. I talked to them and comforted them, by giving them many explanations, after which I said "do you have anything else to ask me?" One of them said: "Yes, I have". "What is it?" I asked. He said: "Please, we don't have water, we don't have rain". So what I had to say to that was: "No, please don't stay idle, because there's no rain. Make sure your farms are prepared, even while you're crying. One day rain may come without you knowing it." I went to another place the same day, some distance away, perhaps 150 km. Upon my arrival, I took the same discussion there, because it was also dry: "Rain may come any time". Exactly as I was saying it, it began to rain. It rained heavily. When I arrived at my destination, late at night, I made radio contact with the first and second places I had travelled through, in order to ask whether the rain had indeed arrived. They informed me that the dams had filled up in less than one night. This contrasted precisely with the examples they had given me: "Look at how the dams are dry, the cattle have no water, the people have no water, because we drink from the same source." They now reported that the dams were full. This is the example I wish to give. Investors therefore must invest knowing that the rain may come.